This home will be going to auction on November 11th at 11AM. This 1,450 +/- SF Home with full basement is a total 2900 +/- SF. 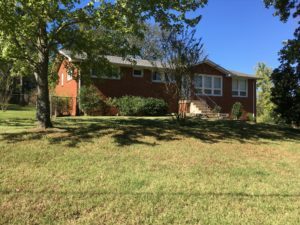 Brick home on corner lot with three (3) bedrooms with one full and one half bathrooms, central HVAC, aggregate drive and fenced backyard. All on a 127 ft x 144 ft located in Hermitage Hills Subdivision. Directions: From Lebanon Rd take Old Hictory Blvd North approx. quarter mile to left on Plantation Dr. then right on Bonnaspring Dr to left on Bonnafield Dr to auction on left. Watch for auctions signs! Announcements made day of sale takes precedent over any previous statements.